Megabytes matter when you are preparing a file for a customer or uploading an item for sale on an online marketplace, such as CreativeMarket. Saving megabytes not only saves you time when uploading, but also saves your clients time and bandwidth when downloading your products. Some sites also have limits on how big a file you are able to upload, so taking some 1s and 0s of your Photoshop file size, may help you keep within such limits. 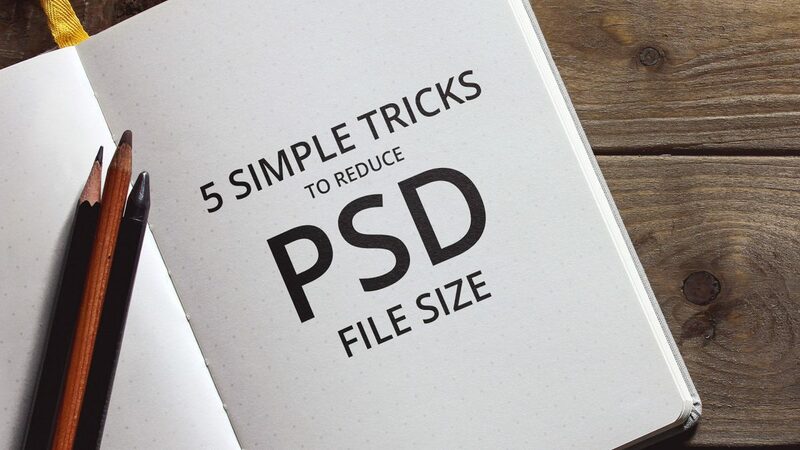 So, in this post, we are going to go over a few simple methods that will drastically decrease the size of your Photoshop PSD files. It might seem silly, but bear with us for a second. Putting a solid colour layer at the very top of your document is actually one of the most effective ways of reducing the photoshop file size. Yeah, sounds crazy right? Go try it yourself; we were able to save upwards of 40% of the file size when dealing with +100MB files, so this simple trick really helps a lot. The reason this trick works is because Photoshop stores some really high-quality file previews which take up enormous amounts of space. Do make sure to clearly instruct your customers to hide this layer when opening the file, to avoid confusion. This trick applies the same principles as the first one. By hiding all layers, you are reducing the Photoshop file size as the file preview will consist of nothing but blank. The effectiveness of this trick is as great as with the first, but remember that it might be confusing for your customers to have to un-hide all the layers of the file, especially if the file contains a lot of layers. This might seem like common sense, but removing all irrelevant layers is easy to forget and will leave you with a file size that is less than optimal. When preparing the file for upload, make sure to delete all the layers you made with notes, measurements, colour samples and what not, during the making of the product. It might not be the biggest reduction in size, but every bit helps and clean files are also much easier to navigate by your customers. Merging and flattening layers is something that can also help reduce the file size somewhat. Just be aware that this step might reduce the editing capabilities of your designs, so don’t forget to have a back-up of your original files. Now go ahead and merge and flatten layers that don’t necessarily need to be edited by your client and that will help you save some much needed megabytes. Just make sure you don’t flatten anything that might be useful for your customers to be able to edit. This will only apply if your Photoshop file has layers that extend beyond the borders of your canvas. The data still exists, even though it is not showing, so cropping that out might save you some extra 1s and 0s. Simply select your crop tool and make sure to check the “Delete cropped pixels”. So, as promised that was 5 simple tricks to reduce your Photoshop file size, but before you go crazy adding solid colour layers or merging your whole document, take the time to consider what is best for your buyers. Would a customer benefit from being able to edit the un-merged elements? Is it too confusing for buyers when all layers are hidden? Will I receive a bunch of support queries asking why the document is only white? These things and more are things you need to consider before applying changes to your files. Also, be sure to very clearly explain to your customers what you did, why you did it and how they get everything back to normal. It’ll make their experience with your products much better and it will save you from an inbox full of support queries, forcing you to use your time to answer emails instead of making even more awesome stuff. We hope you have learned something that you can use moving forward, and that this post will help you overcome, file size limits and also reduce download times for your customers to come. If you have any tips or tricks of your own, be sure to share them in the comments below.